We shifted into Halloween high gear this weekend with a trip to the home of Washington Irving (author of the quintessential spooky story, The Legend of Sleepy Hollow). We enjoyed the music of a hammer dulcimer and haunting tales sung by a masked balladeer. We watched as shadow puppets played out the drama of Irving's much beloved story. We made a scarecrow and played with a hoop and a stick. All of this under an azure autumn sky along the banks of the Hudson River. After coming home and carving our own pumpkins (our roasted seeds turned out perfectly!) I was looking for some last minute fun treats to make this week with my little one. 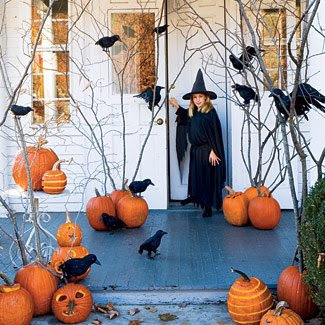 The "Witch on a Stick" looks particularly easy to make. Find the recipe here. 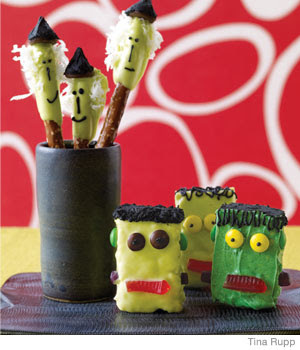 And the "Frankentreats" are just Rice Krispy treats in costume. You'll find those here. 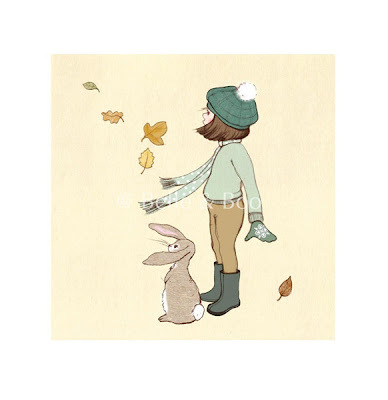 Taking the day off today, Mamas, to explore the gorgeous, autumn landscape that's all around us! We're planning on collecting some leaves to press, hunting down some local Maple syrup and--hopefully--doing some grave rubbings at a nearby historical cemetery, where there are headstones that date back to the Revolutionary War. Have a lovely weekend, Mamas! See you on Monday! When I was a small child, my mother used to tell me over and over, "Patience is a virtue." Then, one day, upon passing a memorial statue in a town square I said, "Look mom, there's patience." Virtue, statue, it all sounded the same to me. Unfortunately, I carried that unfamiliarity with this sanity-saving state of mind into adulthood. Then, I became a mother. Since the birth of my daughter, I've had a crash course in learning about patience and how to practice it. Today I found this amusing little article over at CNN highlighting how to adopt this more graceful attitude. Not only will you be more pleasant to be around, but you'll probably lower your blood pressure, too. The article outlines how to go from road rager to Zen Mama in four easy steps. Can't get it quite right the first time you try it? That's alright. Try again. "Practice makes perfect," my Mama always said. In yesterday's New York Times Health section, there was a raw and powerful essay by N. West Moss about one of the most underdiscussed topics women face: miscarriage. The piece is pitch perfect, full of truncated pain, but brimming with hope. Generally, we don't discuss miscarriage. It isn't a happy topic. We don't blog about it. And when it happens to us or someone we know, some consoling words are whispered and the expectation is that we all move on, and quickly. The tears, the pain and the blood that accompany such an event are usually experienced by an audience of one. As Moss observes, there are no pink ribbons for this cause, to raise awareness or muster sympathy. It is a reality that many, many women endure alone. Miscarriage--while deeply painful--is not, as Moss writes the death knell of hope or motherhood. So maybe we should stop treating it as such. It is not contagious. It is not a bad omen. It is a heartbreaking disappointment that is neither shameful nor uncommon. It is the loss of a dream, the end of a very new reality. But it is not a final analysis. Hope always remains and endures. We are all sisters, even before we are Mamas. With more than a dozen local editions and a comprehensive "Anywhere" edition, reading SuzySaid... is like being BFFs with the hippest, most connected gal in town! I'm also happy to announce that I'm now writing for my local Westport edition, which makes me a little hipper by proximity, I guess. The American Academy of Pediatrics has changed their recommended child's daily dose of Vitamin D from 200 units to 400 units. As CNN reports, this is significant, because most children do not drink the 4 cups of Vitamin D fortified milk that it would take to meet the new requirement. The Academy is recommending supplements for infants (specifically breast-fed infants), children and adolescents. The reason for the change "is based on mounting evidence" of the health benefits of more Vitamin D, including a potential reduction in risk of developing cancer, heart disease or diabetes. In addition to milk and supplements, doctors say that daily exposure to sunlight (minus the sunscreen) is one of the most effective ways for your body to absorb Vitamin D. Additionally, foods rich in Vitamin D include salmon and tuna. The research seems compelling enough, to me anyway, to convince me to add Vitamin D supplements not only to my little one's diet, but to my own as well. What about you? Will you take the Academy's advice and begin supplementing your family's diets? Have a daughter? Know someone who does? Then you might want to watch this video from Dove (yes, the skin care company). And yes, that makes it "advertising." I do, however, still find it relevant, frightening and accurate. We absorb so much data--data that inform our choices, our aspirations, our self-worth--without even realizing what's happening. The younger the "consumer," the less able she is to filter messages and images or discern fact from fantasy. When you watch a video like this, it isn't hard to understand why so many of our girls are unhappy or unhealthy. As parents, we must act as filters for our children. We must help them develop strength, character and self-esteem, before marketers help them identify their "problem areas." And while we're at it, we should stop holding ourselves to other's irrational standards, before our girls start to learn from us what we keep the marketers from teaching them. Congratulations, Dawn! You're the lucky winner of this terrific giveaway, the "Get Your Glow Back" Pack from Rosy Glow! One more reason you'll be glowing: these all-natural products also come in a cute, reusable bag. Email me your mailing address and I'll get the package out to you shortly. Thanks to everyone who participated. And thanks to Margo, the Mama behind Rosy Glow! As many of you know, I'm an avid NPR listener. It's how I get most of my news. I listen to it at home and in the car. 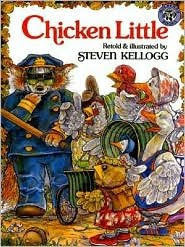 A week or so ago, I realized just how much I listen to it when my little one (she's 2) looked at me and, with her "someone's been naughty" tone, said "The economy's in serious trouble." It was funny. For a minute. Obviously, there's nothing amusing about our collective economic reality. As we parents struggle to trim budgets and stay current on mortgage payments, how much is our anxiety affecting our children? Melissa Schorr, an msnbc.com contributor, addressed this question earlier this week. The prevailing opinion is that the our stress is affecting our kids. Most experts also agree that families need to be honest--in an age-appropriate manner--with their children about their particular situations. Janet Bodnar, author and deputy editor of Kiplinger's Personal Finance Magazine, says "What younger kids are looking for is reassurance." She also cautions parents against their own "fear mongering," advising that "kids take you literally when you say things like, 'We're going to end up in the poor house.'" Also, Bodnar suggests tuning out and turning off the news once in a while. So much for my NPR addiction. Finally, Schorr reminds us that this whole crisis might also serve as a "lesson in perspective." Schorr's article points out that, while our lists of worries grow, how to find clean water or schools for our children to attend aren't things that concern the vast majority of Americans. The same cannot be said for millions and millions of other people throughout the world. Most of us still have blessings to be counted. My most treasured blessing is ready for me to turn off the radio and the computer and read her a book. Miss your pregnancy "glow" that everyone admired? Wondering when those under-eye circles will disappear? Well, Mamas, you can get your glow back sooner than you think with this bag of goodies from Rosy Glow! Rosy Glow is a line of all-natural skin care products developed by--you guessed it--a Mama! The brightening treatment for your eyes will make you look like you got all 8 hours of your beauty sleep. Simple, chic and totally natural, Rosy Glow's line of products are perfect for Mamas whose pampering routine has been replaced by boxes of Pampers. The generous Mama behind Rosy Glow has kindly offered this "Get Your Glow Back" Pack to a lucky Mama's Cup reader. 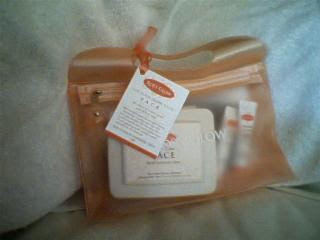 Leave your comment here Mamas, by 5:00 PM Eastern Time tomorrow, to win this bag of natural beauty. The latest toxic product to emerge from China is melamine-tainted milk. I'm sure most of you have heard or read about it. Melamine is nitrogen-rich and can trick tests administered to determine the amount of protein in a product. Companies trying to cut corners by diluting their milk products have been adding this extremely toxic substance to artificially boost the nutritional value of their products. This practice took a particularly sinister turn when Chinese babies started dying of kidney failure after ingesting melamine-laced baby formula. Tens of thousands of infants and children have been sickened. Talk about terrifying. Since then, dozens of products in many countries have been recalled, because they contain melamine-tainted dried milk from China, included products in the U.S. and Europe. Some are brand name products you know and possibly use, like Cadbury. Through all of this, one question has been repeating in my mind: How are mothers in China coping with this? My dear friend Jodi--Mama, writer and Beijing resident--has blogged about it. Her son just turned one in the midst of this scare. Read about her experience at her blog, Blonde in Beijing. I'm always on the lookout for new artwork for my little one's room. 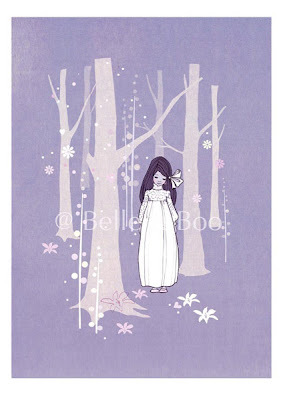 Today, I found these sweet and ethereal images by artist Mandy Sutcliffe, available from Craftsbury Kids. 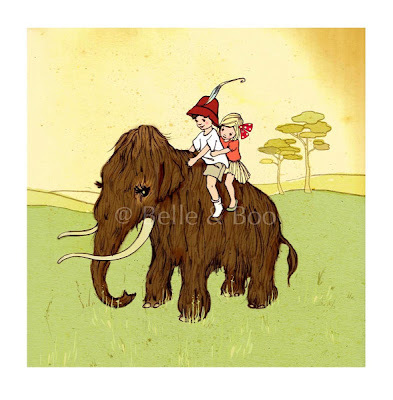 I think I'm so smitten with these straight-out-of-a-storybook pictures that I'm going to have to purchase one for our very own. Now, how to choose just one...? I think I mentioned how much I heart Halloween. I love to decorate, and am a champion pumpkin carver, if I do say so myself. Look at these fantastic decorating ideas from Good Housekeeping. They're so simple, it's scary! 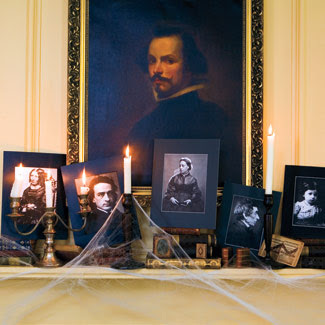 You don't need to break the bank to throw a spooky soiree. Below, some creepy decorations that set the scene for an especially eerie evening. To accomplish the effect in the first photo, you only need sticks or stray branches from your own yard, and some time and creativity to carve your pumpkins. You could scatter some fallen leaves as well. The birds are fun but totally optional. The second look is pure genius: photocopied black and white portraits from history books or encyclopedias. 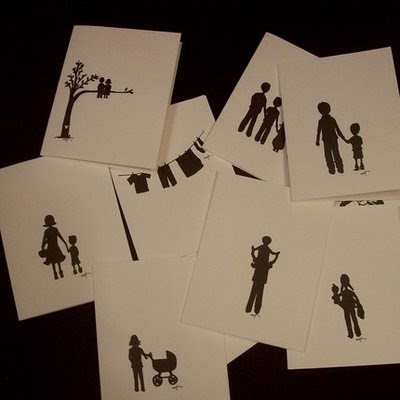 Mount them on some black poster board and display them, clustered on shelves or mantelpieces. 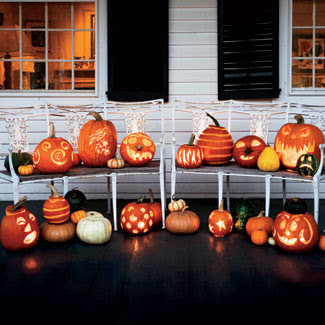 And the third photo is so effective because the pumpkins--aside from being so artfully carved--are different shapes and sizes and clustered together. You don't need two dozen pumpkins of your own to create this effect. A carefully chosen few would have a similar, spooky look. Autumn is my favorite season. The cooler temperatures, the fiery-colored landscape and the fantastic festivals that fill the calendar. Leave it to Cookie Magazine to compile a list of some of the best fall festivals across the country, from California to New York. Get uplifted by hot air balloons in Albuquerque or shuck some oysters in Wellfleet. Pick your festival, pack the kids into the car and get on the way for a weekend adventure! We can't wait to check the Jack-O'-Lantern Blaze festival in super-spooky Sleepy Hollow, NY. My favorite recent purchase arrived in the mail the other day. 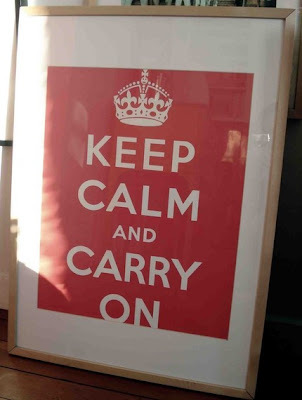 An apt message for these uncertain times, this vintage WWII poster emblazoned with British stoicism is also a perfect mantra for the harried Mama. Mine is displayed proudly in my kitchen, where I have many occasions to look at it and take a breath. Want your own? 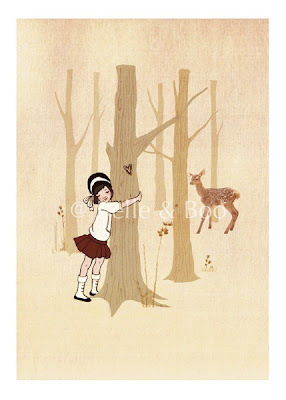 Check out sfgirlbybay's hip little Etsy shop and make it yours! *Bonus: This great art is printed on recycled paper! I love it when I can shop without guilt!